Sheldon Jackson, wife Lystra Jackson with their sick baby Sheenece. 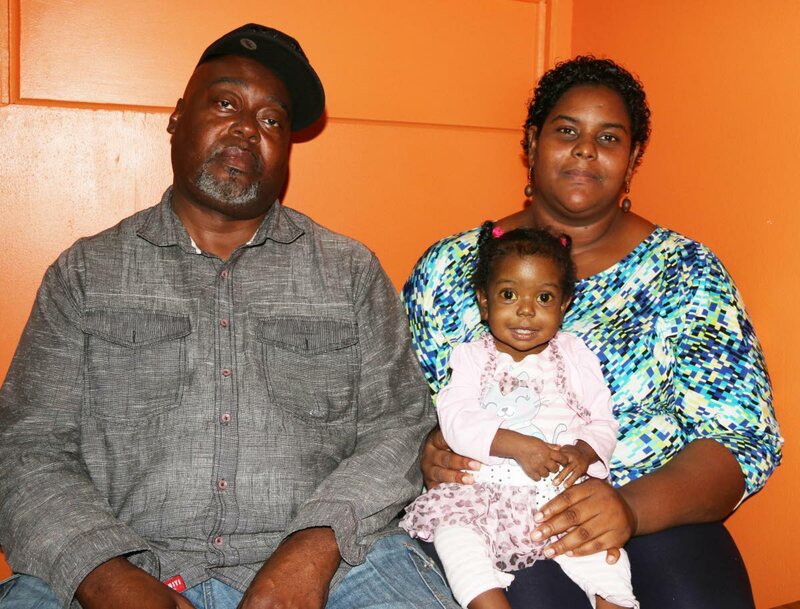 SHELDON and Lystra Jackson, the parents of sick baby Sheenece Jackson, are racing against time to shed over 100 pounds to save their only daughter. They have less than five months to do it. Sheenece must have a liver transplant before she turns two next March, and with no other donor coming forward, doctors have told her parents, who share her O-positive blood type, they are compatible donors. The one obstacle is their weight. Lystra has already lost approximately 30 pounds through diet and exercise – but is appealing to anyone who can help them to shed the pounds faster to call her. She needs to lose another 50 pounds before having tests to prove her compatibility with her 19-month-old daughter, who has been diagnosed with biliary atresia. This disease causes cirrhosis of the liver. In Sheenece’s short life she has already undergone two liv­er biop­sies, three blood transfusions and surgery to re­move her gall­blad­der. Every week she makes at least three vis­its to the Er­ic Williams Med­ical Sci­ences Com­plex, Mt Hope, for different tests. Her eyes are yellow with jaundice, her skin itches and she is only a little heavier than the 12 pounds she weighed at birth. She also retains fluid, which accumulates in her abdomen, causing it to swell. Newsday spoke to Lystra yesterday after another visit to Mt Hope, where blood was again drawn from Sheenece’s frail body for testing. The distraught mother said it pains her every time she has to witness the trauma her infant daughter has to undergo. Without a liver transplant Sheenece will die. But Lystra is confident that: “God will work out everything. I trust, and I believe in Him,” she said. She said people have responded to the newspaper stories in which she appealed for a compatible donor. The surgery is to be done in Argentina and a donor would have to accompany Sheneece and her parents for a month-long stay. The Children’s Life Fund will finance the surgery. “I am just praying for a miracle,” Lystra said. Any­one who wants to help Sheenece can con­tact her moth­er at 342-2710 or 708-5053 or fa­ther at 751-4480. Reply to "Parents diet to save baby’s life"